The latest issue of Astrophysical Journal carries news of new “dark matter maps” of two young galaxies created by astrophysicists at Johns Hopkins University. Although scientists can measure the effects of invisible dark matter, its exact nature continues to be elusive. Past attempts to map dark matter in detail with ground-based telescopes have been fruitless. “Observing through the atmosphere is like trying to see the details of a picture at the bottom of a swimming pool full of waves,” said Holland Ford, one of the paper’s co-authors. Ford and his co-researchers overcame this atmospheric obstacle through the use of the space-based Hubble telescope, from which they gathered images of two galaxy clusters (each containing more than 400 galaxies) in the southern sky. The two clusters of galaxies are relatively young, forming when the universe was about half its present age. The research team measured the subtle gravitational “lensing” apparent in the Hubble images – small distortions of galaxies’ shapes caused by gravity from unseen dark matter – to feed into a computer simulation that produced the detailed dark matter maps. 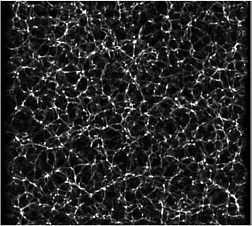 Researcher Myungkook James Jee said the maps provide evidence supporting the theory that the galaxies we can see form at the densest regions of “cosmic webs” of invisible dark matter, just as froth gathers on top of ocean waves. “The images we took show clearly that the cluster galaxies are located at the densest regions of the dark matter haloes, which are rendered in purple in our images.” The clumped structure of dark matter around the cluster galaxies is consistent with the current belief that dark matter particles are “collision-less,” Jee explained. Physicists speculate that unlike normal matter particles, they do not collide and scatter like billiard balls but rather simply pass through each other. “Collision-less particles do not bombard one another, the way two hydrogen atoms do. If dark matter particles were collisional, we would observe a much smoother distribution of dark matter, without any small-scale clumpy structures,” Jee explained. The new findings support the theory that dark matter – which accounts for 90 percent of the matter in the universe – and visible matter should coalesce at the same places because gravity pulls them together. Concentrations of dark matter should attract visible matter, and as a result, assist in the formation of luminous stars, galaxies and galaxy clusters. Some dark matter map images for your edification.